I just saw Harry Potter and the Deathly Hollows part deuce. Loved it. It was much better than the last movie, Harry Potter and the Wandering Aimlessly for Two Hours. I’m going to talk specifics about the movie, so if you haven’t seen it yet put your fingers in your ears and sing “La, la la,” for a few minutes. I just want to make a quick statement about a minor controversy going around concerning Potter and religion. No, I’m not going to address the fear some Christians express that J.K. Rollins books are bad because they contain magic. I’m going to brush that aside as quickly as if I had a flying broom. CS Lewis’ Chronicles of Narnia is full of magic and Christians don’t have a problem with that. So I’m calling poppycock on that controversy. 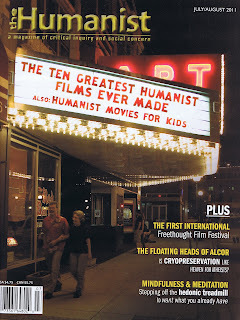 Check out the the magazine The Humanist for July/August. They were kind enough to publishtwo, count them TWO, of my articles. I wrote Real to Reel, which is a list of my favorite Humanist films. I also interviewed Andrea Steele, Founder and Executive Director of the Freethought Film Festival, held last month in Tampa. I hope you enjoy the read.